Her engagement to Prince William may have been announced just yesterday, but Kate Middleton’s style is already under such scrutiny that her Issa engagement dress has proven an instant sell-out. 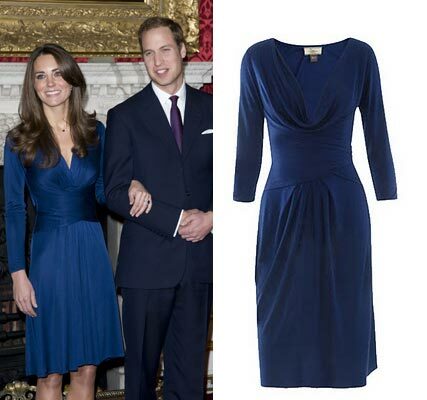 The bride-to-be chose a £385 Issa London sapphire dress for the official engagement photocall – the perfect match to that ring – which instantly sold out in on the Matches website. Ms Middleton’s designer choice shouldn’t come as a surprise – she’s been a firm fan of the label for years, wearing its dresses to a number of high profile events, including the wedding of Harry Meade just last month. Now the rumour mill is abuzz with whispers that Issa’s Daniella Issa Helayel could be in the running to design Kate’s all-important wedding dress. The designer has recently started to create custom-made bridal gowns, but could she be in line to design the dress of the century?